For some, eating a doughnut every morning is a recipe for heart attack. 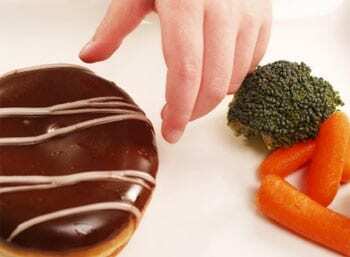 For others, the doughnut doesn’t seem to matter–it’s almost as if certain individuals can’t get heart disease even if they try. The flip side is that people who are predisposed to heart disease can make lifestyle changes, in this example by cutting down on saturated fats and cholesterol, to decrease their odds of actually experiencing a heart attack. This is because heart disease is caused by a combination of genetic and lifestyle factors like diet and exercise. As a new paper published last month in PLoS Medicine illustrates, lifestyle choices can have an even greater impact on heart disease risk depending on a person’s genetics. The study’s findings suggest that diet influences the association between SNPs in the 9p21 region of the genome and risk for heart attack and cardiovascular disease. The 9p21 region is one of the most established genetic associations for heart disease, but until now its interactions with environmental factors had not been thoroughly investigated. The current study, conducted by Ron Do of McGill University and the INTERHEART consortium, was carried out with DNA from over 27,000 people of different ethnicities. A number of studies have shown that people who are GG at have about 1.5 higher odds of having a heart attack. In the current study, people who were GG and only occasionally ate raw vegetables and fruit had a two-fold higher risk of heart attack compared to controls who were AA and ate a similar diet. The surprising finding is that people who were GG and frequently ate raw vegetables and fruit did not experience heart attacks more than controls. The effect of diet on the association between SNPs in the 9p21 region and heart attack risk was strongest for people of South Asian ancestry. The evidence for this effect was suggestive but weaker in the European, Latin American, and Chinese populations studied. Although the researchers also looked to see if smoking and exercise modified the relationship between 9p21 SNPs and heart attack risk, they didn’t find evidence of a connection. These findings suggest that people with a predisposition for coronary heart disease, at least based on their genotype at 9p21, can eat a heart-healthy diet to decrease their chances of actually experiencing a heart attack. Thus, having two risky versions of these SNPs isn’t necessarily a recipe for heart attack. We already know that diet strongly impacts health–indeed there is a reason why your parents told you to eat your vegetables–and this study suggests that diet may actually override genetic risk in some cases.